In conjunction, see Bermuda's History through the 1600s. Welcome to the fifth oldest Northern European municipality in the Western Hemisphere, after St. John's in Newfoundland founded by the British; Annapolis Royal (formerly Port Royal) founded by the French in Nova Scotia, in 1605; Jamestown, Virginia, founded by the British in 1607 and Quebec City founded by the French in 1608. All were long after the Spanish founded their empire in the New World and the Portuguese theirs. Bermuda's first capital, St George's, was settled in 1612 and is the oldest continuously inhabited English town in the Americas. 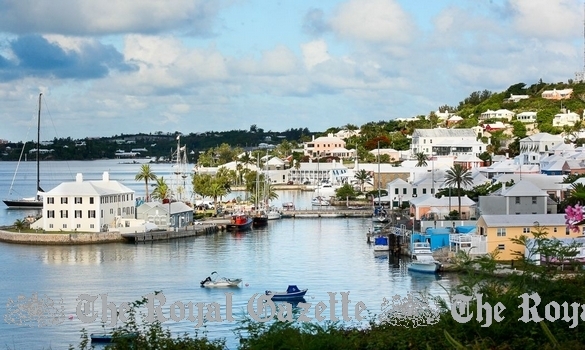 St. George's used to be Bermuda's capital until the 19th century after being substantially outgrown by Hamilton. 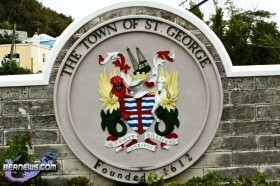 Officially, it is the Town of St. George, but known to locals as St. George's. Many old stone buildings still stand today (built from models and drawings originally from England). They were built from Bermuda stone after 1619 for protection against elements and fires. Before that, they were thatched with palmetto. 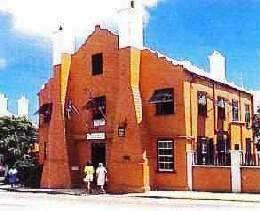 Their external British Bermudian architecture has not varied much in 380 years. 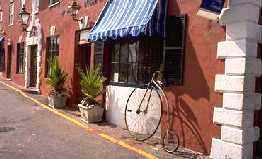 The town has remained a port, residential and trading center. It was Bermuda's original official capital until 1815. Many properties have remained in the same families. Cobblestones on the sidewalks (pavements) of the streets were imported from Wales (as none were available from local materials in Bermuda). For at least a century now the town has been populated by individuals whose ethnicity and heritage are mostly African Bermudian, not European Bermudian. There are also a Town Gateway, Town Center Gateway, heraldic signs and a small new public garden. Since the mid-1990s the town’s narrow streets and lanes have, one-by-one, been dug up and re-paved to create a more old world feel to the World Heritage Status town. The town occupies a unique place in Bermuda's history. Discovery Bay, not far away, was the first place in Bermuda where in 1609 British colonists under the command of Admiral Sir George Somers landed involuntarily after their ship the Sea Venture, en route to Jamestown, Virginia, sank after being destroyed by reefs. Prior to that, Bermuda had been uninhabited except by stranded Portuguese and Spanish mariners in New World expeditions. It was from this place in Bermuda that in 1611 those same British colonists landed in Jamestown, Virginia, to help replenish the dwindling colonists, provided the starving Jamestown folk with food brought from Bermuda and, via John Rolfe, one of the new arrivals from Bermuda, provided them with tobacco found growing in Bermuda which later became a major American industry. The town also played a role in the American Revolution. Bermuda depended on the American Colonies for food, and when the war began, supplies grew dangerously low. Defying and ignoring the town-based British governor, George Washington and prominent British Bermudian but pro-American legislator and landowner Henry Tucker and his friends agreed that Tucker and his supporters would steal a large quantity of town-based British Army gunpowder for food under the cover of night and roll it down the hill to nearby Tobacco Bay from where it was loaded on to American ships, in the very first action by a group of American sailors and militia who later became the US Marine Corps. The town was used by the British as a prisoner-of-war camp for crews of American ships captured and brought to Bermuda. During the war of 1812-14, this time when Bermudians were more openly pro-British, the town again played a significant military role, both as a depot for British prison ships moored at Convict Bay once again housing American prisoners-of-war and again as the capital of Bermuda from which the Attack on Washington DC was planned from the Royal Navy's main command post then at Mount Wyndham nearby. The town played a major role in the US Civil War, but not on the Union side, instead the Confederate side. It did so for urgent socio-economic reasons, primarily because North Carolina and Virginia were by far the closest mainland areas to Bermuda and both were long-established centers of commerce for Bermuda in trade and commerce, with Virginia in particular offering many historical and family links with Bermudians (not Bermudans). From Liverpool, England, Glasgow, Scotland and many British ports in between, ships sailed to Bermuda laden with cargoes bound, via Bermuda, for Confederate ports. More details about this are shown later. The town played a key role in World War 2, with, from 1940 the building from scratch nearby of a brand-new US Army (later US Army Air Force, later USAF, later USNAS) base on St. David's Island and, in addition, the creation from 1942-1944 of a US Navy submarine base in the town at Ordnance Island. Thousands of Americans, initially civilians building the new base, then military personnel, brought with them dredgers, earth-moving equipment, motor vehicles not previously seen in the town, aircraft, heavy guns and other weapons and submarines. St. George's was their nearest town. They changed the geography of Bermuda and altered local life significantly. Thanks to a British Government (not Bermuda Government or Bermuda Tourism) initiative (because the United Kingdom, not Bermuda, is a member of UNESCO), on November 30, 2000 it became one of the (now over 1,000) World Heritage properties - the list increases each year - in 145 countries on the UNESCO list - see http://whc.unesco.org/en/list. Briton Frank Lawrie, on behalf of the British-UK committee that makes recommendations for UNESCO World Heritage status, had earlier visited to help get the town formally nominated by Britain as a UNESCO World Heritage site. He was then a senior United Kingdom civil servant with Historic Scotland. Thus, on the UNESCO country-by-country listing, it is not shown under "Bermuda" but as one of the World Heritage sites of the United Kingdom of Great Britain and Northern Ireland. The British Government had to be involved in classifying it as a British overseas territory and therefore as one of Britain's such sites. It was described as “The Town of St George's, founded in 1612, an outstanding example of the earliest English urban settlement in the New World. Its associated fortifications graphically illustrate the development of English military engineering from the 17th to the 20th century, being adapted to take account of the development of artillery over this period.” See it there under the UK as the Historic Town of St. George's and Related Fortifications. What constitutes a World Heritage site? It is not a country but a specific place or places within a country that make them historically, culturally and in specific other respects unique. This is why some countries have more than one UNESCO World Heritage sites. Italy, for example, has 47; Spain has 43; China has 41; the UK, including Bermuda and other British Overseas Territories has 28, the same as India; the USA has 21, etc). As Bermuda is so small (only 21 square miles or 58 square kilometers in total size) compared to these countries and with her former colonial historical and cultural uniqueness already recognized by UNESCO through Britain, it is unlikely there will be any further World Heritage Site additions in Bermuda in the foreseeable future. Until 2011, UNESCO was funded principally by the USA. On April 26, 2001 The Princess Royal, Princess Anne, was present in the Old Town, with appropriate formalities and other dignitaries, to mark its World Heritage accreditation. These UNESCO sites are deemed important for all humanity rather than just the host nation or island or nation nominating another as happened in this case when Britain recommended its oldest British Overseas Territory, Bermuda. One of the criteria for inclusion on UNESCO's list (with Britain being a UNESCO member, Bermuda is not) is "to represent a masterpiece of human genius." In this case, the genius was the ability of the British ship Sea Venture to reach Bermuda in 1609 albeit by accident not intent under the leadership of British Royal Navy Admiral Sir George Somers and to establish Bermuda as a British Colony with its first settlers all from Britain. On April 1, 2011, Bermuda's Municipalities Act 2011 replaced the earlier Municipalities act 1923. Since April 1, 2011, all residents on the electoral register of the town have the right to vote. Earlier, only town businesses and their owners could vote. The change meant that the Parliamentary Election Act now applies to municipal elections as well, run in the same way as national elections. Anyone ordinarily resident in this municipal area is allowed to vote and electors' names are taken from the annual Parliamentary Register, compiled every June. This ancient town began three years after Bermuda was founded in 1609 - by accident- as a British colony in 1609. Nine ships left England under the overall personal command of Royal Navy hero Admiral Sir George Somers. He was born and bred in Lyme Regis, the lovely historic town in Dorset, England from where Bermuda's History began. Lyme Regis has a special section on this unique chapter of Bermuda's earliest colonization history. It can be found at "Lyme Regis and Bermuda." Centre graphic: Town in 1618. Under the command of Admiral Sir George Somers, Royal Navy, the fleet sailed from Plymouth in Devon, England. They were bound for Jamestown in Virginia under the first 17th century Virginia Charter of April 10, 1606 - not the Second Virginia Charter of May 23, 1609 as some historians believe, wrongly. But the flagship "Sea Venture" was blown off course and wrecked on the reefs off Bermuda. Another vessel - the "Catch" - perished in the same tempest. Stranded here for 42 weeks, the colonists left Bermuda in 1610 in two small ships and with many local provisions. They arrived in Jamestown in time to rescue it from starvation. 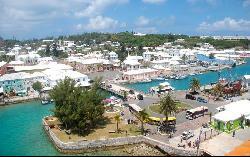 The town was the first municipality in Bermuda, established before St. George's Parish (in which the town is located). It was referred to initially as New London. It was first populated by British settlers. They arrived in 1609 by accident instead of going to Jamestown in Virginia. Admiral Somers wrote his last will and testament at his home in Lyme Regis on April 23, 1609. It was just before he set out for Plymouth in expectation he would reach Virginia but instead was shipwrecked on what is now St. George's Island, Bermuda. The writings in 1609 and 1610 of William Strachey from Lyme Regis have been recorded in local, American and British history. It was as a direct result of how the Bermuda colonists rescued Jamestown in 1610 that Bermuda was included by name with Virginia in the Third Virginia Charter of March 12, 1612 and settled deliberately. Stachey wrote the main accounts and was described in the original ship's manifest as Secretary Elect to the Deputy Governor of Virginia. Later, Strachey became famous as the author of the first code of laws for Virginia. 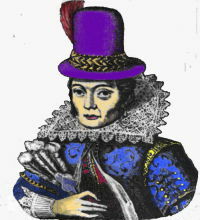 The colonists who arrived in Jamestown included widower John Rolfe (later the husband of Princess Pocahontas, pictured, above, right) whose first wife and infant child died in Bermuda. The women among them were the first ever to be allowed in as voluntary female colonists. Goods carried by them included large sea shells like conch, coral for ballast, the original signet ring of Strachey with his family crest and more. They are all now preserved by a Jamestown museum. Thus this earlier Bermuda town has great importance in early British North America as the catalyst of British colonial development in North America. By contrast, not until 1620 did the "Mayflower" - also from Plymouth in England - reach Plymouth in Massachusetts. In 1609, Admiral Sir George Somers (see painting above, left), who founded Bermuda, named the town not after himself but in honor of the Patron Saint of England, St. George. The admiral's ships all flew the flag of St. George, as ships of the Royal Navy still do today. The Admiral died in Bermuda on April 24, 1610 - a day after the anniversary of his patron saint. But in this British colonial town named after the saint, the Flag of St. George is flown only over St. Peter's Church, not in the town proper, not even on April 23, the official feast day in England of St. George, who died in 304. No particulars of his life have survived but veneration of Saint George as a soldier saint is extensive, not just in England, especially in the east where he was martyred. It is not known how and why he became the patron saint of England. But his cult was popularized by crusaders returning from the east, initially led by King Richard of England. This is why St. George is most often shown wearing a white tabard with the red cross of the crusaders and is the patron saint not only of England but also Boy Scouts (as St. George was a hero of Lord Baden - Powell), various places in Spain and elsewhere. Places in the United Kingdom dedicated to his saintly name and history include St. George's, Vale of Glamorgan, Wales; St. George's Island, Cornwall, England and Ogbourne St. George, in Wiltshire, England. Other places include this town, of course; St. George's Parish in Bermuda; Georgetown in the Cayman Islands, Georgetown of Guyana in South America and St. George's of Grenada in the Caribbean. None are as old as our town. April 23, 1564 was the birth, at Stratford upon Avon, Warwickshire, England, of British playwright William Shakespeare. For Bermuda, he has a special claim to fame. His story about Bermuda in 1610 as the still vexed Bermoothes in "The Tempest" where the settlers had been alive and well after all after the sinking of the "Sea Venture" and had succeeded in their journey from Bermuda to Jamestown in Virginia, made the Town of St. George and Bermuda famous. It was because William Strachey wrote the description of the wreck of the Sea Venture in Bermuda in 1609 and the time spent there by the passengers and crew. He spent a year in America before returning to Lyme Regis. It was mostly from his accounts that Shakespeare wrote The Tempest. Except that instead of correctly showing Bermuda, Plymouth and Virginia in his story, he used an Italian island and the people as mythical. Yet there are many sections of his play where he originally used the word for word accounts of the epic voyage of the "Sea Venture" ship that ended its days in Bermuda and gave him the inspiration for the drama. He was a friend of the Earl who knew Admiral Sir George Somers well. He was the first famous literary historian of Bermuda. He was the son of John Shakespeare, a highly respected citizen of Stratford, where he held various offices including that of bailiff, or presiding officer, and his wife Mary, the daughter of Robert Arden of the Warwickshire landed gentry, closely related to the ancient Catholic family of Arden. 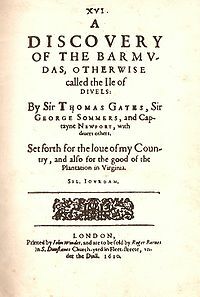 Alas, all versions of "The Tempest" have used the fiction of Shakespeare, instead of the facts and accounts of the "Sea Venture" he was given. When he died in 1616 - also on April 23 - at Stratford upon Avon on his 52nd birthday, his dramatic works were of critical importance for the hundreds of compositions they inspired from composers from then to now. At his death, more than half of his plays remained unpublished. They appeared for the first time in the famous First Folio of 1623. The seaside town in Dorset, England - many centuries older and also a World Heritage site - occupies a unique place in Bermuda and English history. It is because our famous Admiral Sir George Somers - the man who discovered and colonized and is the Father of Bermuda - was born, lived in, represented and was buried there. He was accompanied to Bermuda and Jamestown by other settlers from Lyme Regis. They included scribe William Strachey. 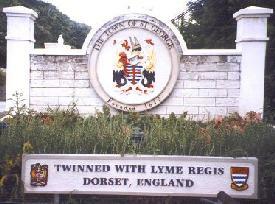 Lyme Regis was granted its Royal Charter in the year 1284, hence its Latin version of Royal in its name. It was then a prominent English port. Admiral Sir George Somers - born on April 24, 1554 and shown on the left - was one of the sons of John and Alice Somers, both also from Lyme Regis. He became a Freeman, first a Mayor of and then a Member of Parliament for Lyme Regis. He married Joanne Somers - originally Heywood or Hayward. She was also from the town. Once established, they lived in Berne Manor, near Lyme Regis. Much later, Lyme Regis had other famous figures. They include Jane Austen - with her "Persuasion" in Lyme Regis. She wrote many books. Modern author John Fowles established an international reputation with his The French Lieutenant's Woman. He was then the Curator of the town museum. 2009. To celebrate 400 years ago when Admiral Sir George Somers left his native Lyme Regis on the Dorset coast in the flagship Sea Venture intending to sail to Virginia, but became shipwrecked on Bermuda, a traditional civic procession walked through Lyme Regis, along Marine Parade, to the Cobb, where a plaque commemorates Sir George, sometime Mayor and Member of Parliament for the historic town. Mariea Caisey, in her last year as Mayor of St. George's, visited the UK resort to greet Councillor Michaela Ellis, elected Mayor of Lyme Regis only four days before. Her predecessor Sir George Somers had been Mayor in 1604. Police stopped the traffic on the busy bank holiday, so the long procession could walk along the main road, led by the two macebearers and preceded by the Lyme Regis Junior Band and the majorettes. On a hot, sunny day there were many spectators along the route. At the Cobb, on the 13th century harbour wall, Lyme Regis Town Crier Phil Street and St. George's Town Crier David Frith in turn saluted the memory of Admiral Sir George Somers as the flags of both towns were hoisted aloft. Alan Vian portrayed the Admiral, recalling his farewell words as left Lyme Regis. Rev. Stephen Skinner gave the blessing and the mayors returned along the Cobb to the marquee by the Marine Theatre for lunch. A toast to the success of the twinning was drunk with Bermuda Dark 'n' Stormy (rum and ginger beer, the original name of which was the Scapa Flow). 1996. July 25. Lyme Regis and this town were twinned, initially in Lyme Regis. Then-Mayor of St. George Henry Hayward and then-Lyme Regis Town Council Mayor Mrs. Barbara Austin signed the documents. A flight of the Royal Air Force's Red Arrows acrobatic team roared overhead. They used smoke to form a heart shaped image over Lyme Regis Bay, in tribute to Bermuda where Admiral Somers in 1610 asked that his heart be buried. Other ceremonial events included the raising of the flags of Bermuda and Lyme Regis in the British town where the body - minus his heart - of Admiral Somers was landed for burial in Lyme Regis after he died in Bermuda in 1610. His remains are interred at the nearby church going back to the 9th century and a brass plaque records how he was buried on July 4, 1611. It was erected by public subscription in 1908. Special twinning message of congratulations from Her Majesty the Queen to both towns were read and paintings were exchanged by the Mayors. Bermudian guests were taken to see the still standing old Lyme Regis home of Sir George and Lady Somers. The local newspaper, The Lyme Regis News, published an eight page color supplement. Later, Mrs. Austin visited Bermuda. One of her three sons is Kerry Austin. Another is a photographer whose works have been featured in Bermudian and prominent United Kingdom publications. The municipal entity that runs the town. The British-style administration of the town is headed by the Mayor, In 2015, on May 8, Quinell Francis was named the new Mayor of St George’s after soundly winning a three-way race for the seat. Ms Francis won 58 per cent of the vote (278 votes), toppling incumbent Mayor Garth Rothwell, who won 37 per cent (177 votes), and Alfonso Harris, who won five per cent (23 votes). Ms Francis, who had served as deputy mayor in the build-up to the election, stepped forward as a candidate for the mayorship because she wanted the residential and business community singing from the same page. She also said she wanted to build on the work of the Corporation over the last few years, moving St George’s forward as a community. Speaking after the announcement, surrounded by supporters and well wishers, she said she was overwhelmed by the victory. “I’m excited, I’m happy and I’m glad that the voters felt confident enough to make me the next mayor. I’m going to hit the ground running. I’m going to sit with my team, who have already been selected, and we are going to strategise so we can move forward. I want to get this marina going. That’s our number one thing. We are going to have an agreement soon, we are going to have a town-hall meeting very soon, we are going to have decisions made and we will be ready to go.” Home Affairs Minister Michael Fahy said he was eager to begin working with Ms Francis, congratulating her on her election. “There are many exciting upcoming projects in St George’s for which the mayor will be at the helm including a new marina for the town, which will attract new yachts to the area, as well as provide additional facilities for the America’s Cup which should help to stimulate the economy in the east. I have no doubt that the Mayor and the new council will continue to ensure the beautification of St George’s in keeping with UNESCO heritage site standards.” Mr Harris meanwhile had pledged to bring more business to the town and would have backed proposed modifications to Town Cut to allow larger cruise ships. No elections for the town’s councillors were required in St George’s because only eight people put their name forward for the eight positions. The business ratepayers councillors are Philip John Seaman and Faith Meri-Eve Bridges, while the municipal residents councillors are Anthony Richardson, Calvin Bean, Phillip Anderson, Eakin McLaughlin, Elizabeth Christopher and Jamie Sapsford. Ms Francis will remain in charge of the town’s activities committee while Jamie Sapsford will run the governance, legislation and safety committee, Phillip Anderson will chair the infrastructure and development committee and Anthony Richardson will take charge of the finance and property committee. All matters about the town past and present should be addressed directly to the Mayor and Corporation, at "Buckingham," 2 King Street, St. George's GE 05, telephone (441) 297-1532, fax 297-0062. Or e-mail corpstg@northrock.bm. Or at Storekeeper's House, 5 Ordnance Island, St. George's GE 05, same phone number. Full-time officials include the since 2014 appointed Town Manager and Secretary of the Corporation of St. George who serves as the Chief Administration Officer, executing the strategic plan; overseeing the day-to-day operation of the Corporation of St. George office and ensuring that they consistently exceed the expectations of constituents, visitors and stakeholders. Book about the town: The Historic Towne of St. George. By British-born Bermudian the late David Raine, local resident and town councillor who died in August 2004 at the age of 63. 2018. March 6. Residents of St George’s are happy with the progress being made on the St Regis hotel — and at being able to reach the beach. Quinell Francis, the Mayor of St George, said that despite early concerns, the public had embraced the project. She said: “Access to the beach, which was a primary concern, has been clearly identified and people are quite happy they can still reach the beach even with the construction going on. Everyone is positive, everyone is anticipating a great project and we are looking forward to the summer to see how the parking works when people come to utilize the beach.” She added the Corporation of St George has been in talks with the Government about ensuring quality public facilities at St Catherine’s Beach. Ms Francis said: “Ideally, the facilities there will be an upgrade from the porta-potties. If you have a five-star hotel, you should have some good public facilities as well. They have assured us they will be working on that as well. I’m hopeful that happens sooner rather than later.” The hotel is not the only construction project taking place in the East End. Ms Francis said the Corporation of St George is working on several projects and a comprehensive town plan to improve the municipality. She said: “We are still improving the infrastructure of the ferry terminal at Hunters Wharf. We are just putting in a few parking bays for private cars as well as a drop-off for the buses and taxis down there. We didn’t complete it last year due to the construction of the seawall running over. We are also moving the stocks to Ordnance Island. The idea is we will make Ordnance Island more of a recreational spot and draw more people over there, with the Deliverance being at centre stage.” As part of the plan, she said the corporation is looking to pedestrianise Ordnance Island. Traffic flow in the town could be further altered next year, with vehicles diverted farther from King’s Square. Ms Francis said: “A longer-term plan we are considering is the pedestrianisation of King’s Square. We are hoping to have that done for next season and we are doing a traffic assessment looking into how we can move our taxes and minibuses through. We like the idea of people coming down Water Street and flowing into a pedestrian area rather than a highway. If we move the stocks, we can create a roadway coming right over on to Bridge Street.” The mayor said the corporation also planned to revitalize Somers Gardens to make it more “vibrant”. She said the corporation is in discussions with the Ministry of Public Works to modernize the wastewater system. Ms Francis said: “The recommendations have come in from the overseas company contracted to do the study and we are waiting for Cabinet papers so we can move forward. The whole waste water plan involves utilizing BLDC [Bermuda Land Development Company], with their system expanded, so the entire island of St George’s can be added to that. 4 Blockade Alley, Town of St. George. Originally called Lough House. Name was changed in the 20th century. Won the 2003 Bermuda In Bloom best Garden in this Parish Award. A privately-owned, not open to the general public, historic house in the Town of St. George built by one of the town's most prominent 18th-century citizens. He was the Honorable Dr. George Forbes, originally from Strathdon, Aberdeenshire, west of Aberdeen, in Scotland. Born there in 1710 he was a graduate in 1734 of the University of Aberdeen, specializing in "phisick and surgery." He emigrated to Bermuda shortly after his graduation, as a medical doctor. He brought with him recommendations from his relatives Lord Forbes, the Duchess of Gordon and his kinsman, Lord Gordon, Sir Arthur Forbes and Sir Duncan Forbes. In Bermuda, he fell in love with and married Mary Jones, daughter of Francis Jones, a prominent local merchant, councilor, militia general and frequently Bermuda's President (leading legislator, president of the legislative counsel). He became renowned throughout Bermuda for his decency and humanity. He pioneered smallpox inoculation in Bermuda and saved many lives. He was the personal doctor of Governor William Popple and became a councilor, vestryman, Justice of the Peace in 1763, briefly Chief Justice in 1749 and, like his father-in-law, President of the Council, member of the Executive Council of the Bermuda Government. In 1759 he was made the Honorable George Forbes. He purchased Paget Island - then called Paget Ford Island and 36.35 acres - in St. George's Parish for sixty pounds sterling. There is a large tomb in his honor on the left, shortly after you enter the ancient church of St. Peter's in the old town of St. George. His first child was Francis - born at Brackish Pond, Devonshire, Bermuda. Others, including James, William and Thomas, were born in the old town above. Two sons, Francis and Robert, were sent to medical school in Edinburgh and two others, William and Thomas, left Bermuda and became merchants in St. Kitt's, West Indies. James did not succeed as a merchant in Georgetown, now Guyana, and Charlestown, South Carolina, and returned to Bermuda. Dr. Francis Forbes married Mary Tucker of Bermuda and had a son, also Francis, later Chief Justice in Canada, was knighted and as Sir Francis Forbes was transferred by the British Government to Australia as Chief Justice of New South Wales, lived in Sydney and died there. His descendants today include Forbes family members of Sydney, Bermuda, Scotland, England, South Africa and Forbes wineries in Victoria, Australia. Some time later, the house passed to a member of the Lough family which descended from the Forbes family of Bermuda. During the American Civil War it was leased by the Confederate military agent in Bermuda, Major Norman Stuart Walker, and his family. Lough House was where a son of Major and Mrs Walker was born on June 15, 1863, and at the special request of Mrs. Walker, a Confederate flag was ceremoniously draped over her lying-in bed. It then had various owners including F. C. Outerbridge and at one point was subdivided. Now owned by a member of the Hayward family originally from St. David's. Now HSBC after the worldwide bank that acquired the Bank of Bermuda but still called this locally. Built in the 1970s as a bank after a former grocery store was demolished. The present parking lot is believed to be rich in history. 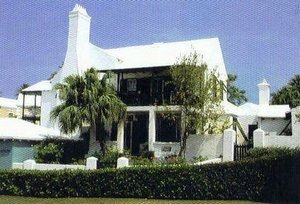 In the town's earliest years - dating back to when Governor Richard Moore began it, was the first Government House in Bermuda - dwelling of the Governor and seat of the British colony. It was noted by Nathaniel Butler, Governor 1619-22, as a handsome house built of wood, in the shape of a cross. It was demolished by Samuel Harvey in 1693 after being in disrepair since 1685. When built, it was on part of a sea inlet - no longer there. When the second Government House was built in 1699 nearby by Governor Samuel Day, the area that housed the original Government House became a garden for the second Government House - later, the Globe Hotel. 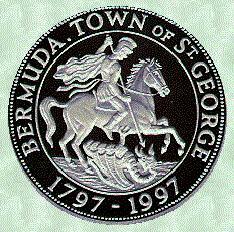 In those days and until 1815, St. George's was the capital of Bermuda. The area may have degenerated into waste land until the 1930s, when John Smith built a grocery shop on the site. From April, 2007 Bermuda’s three fire departments were unified into a single national fire service. Until then there was volunteer St. George Fire Brigade. There is a town depot. Technically, the town got World Heritage status not only for its municipality (as a town, not a city by any British or North American definition) because of the former British Army then in Bermuda forts guarding it. Those in this Parish - but not the town although some of the following are very close to it by land or sea - include some of the oldest and most historic, as well as most picturesque in Bermuda. The town has hundreds of British Army and Royal Navy reminders. At one time, the British Army had extensive barracks just up the hill from the town. Its official garrison church was St. Peter's, where regimental flags and pennants used to fly and plaques still in the church show the town's many links with the British Army. And the Royal Navy once had many vessels moored in the harbor. There is a Police Station on Duke of York Street. York and Water Streets. Telephone 297-4126. Registered charity # 406. It shows the history of the black people of Bermuda and local black history. Began on March 8, 1998 under the leadership of Mrs Joy Wilson-Tucker. Staffed by volunteers. Tuesday to Saturday from 10 am to 3 pm. There is an admission charge per person. There are two floors. Of interest are collections of old photographs and sculptures. Notable in the Eagle Room is "Minna, the slave girl" crafted in Bermuda cedar by local artisan Hubert (Cookie) Spence. She was mentioned in the book "Chained on a Rock" by the late author, librarian and historian Cyril Outerbridge Packwood, one of the museum's founding members. Of outstanding interest are the beautiful and intricate Bermuda Cedar animals carved by Bermudian David Ifor Nisbett, a retired master craftsman and former superintendent and once manager of one of Bermuda's largest wood-working facilities. Book: Rogues and Runners. Bermuda and the American Civil War. Catherine Deichmann. 2003. Information about the American Civil War from the exhibition in the Globe Hotel in St George's. 79 pages, paperback. 32 Duke of York Street, across St. Peter's Church. Telephone (441) 297-1423. In the renovated (at a cost of $431,000) Globe Hotel, King's Square, owned by the Bermuda National Trust. Open Mondays to Saturdays, 10 am to 4 pm and on Sundays, 1 pm to 4 pm. It began life as Bermuda's second Government House - dwelling and seat of power of the colonial Governor (Samuel Day) from 1698 to 1700. When he refused to give it up after being replaced as Governor, it became his private residence and a third Government House was built on the site of the Unfinished Church. Later, as the Globe Hotel, it became the headquarters of the Confederate Agent in Bermuda in the American Civil War. For many years it was known as the Confederate Museum, until this upset an American writer who perhaps did not appreciate the historical and socio-economic reasons far beyond the slavery issue which had earlier bound Bermuda to Virginia and North Carolina. It was later referred to as the site of the Rogues and Runners Museum. But it became known as the Confederate Museum for a good reason, because when the American Civil War began in 1860, it was not long before Bermuda, with its convenient access to open ocean and this town in particular having a military strategic advantage, became the second-largest, after Nassau, Bahamas, transshipment base for large British-built but not British-approved (because Britain was officially neutral) ships crossing the Atlantic to the Confederates. Many ships carried the goods to Bermuda, from where they were trans-shipped to Confederate ports, some by Bermuda-owned, the majority Confederate-owned vessels. Many of those ships were built in or near Glasgow, Scotland, UK and sold to Confederate interests. Here were placed detailed displays, maps, memorabilia and period furnishings on Bermuda's US Civil War involvement, biased towards the Confederates. Artifacts tell of blockade running and linking Bermuda with the Confederates, thanks to the skills of Britons and Canadians. Bermuda, this town in particular, was the principal West Atlantic base for smaller but faster, also mostly British-built but Confederate-owned fleet of blockade runners. In defiance of British neutrality laws or regulations, large ships from the United Kingdom unloaded in St. George's huge cargoes of arms and ammunition, cannon, gunpowder, lead and other tools or weapons, plus huge amounts of smokeless anthracite coal from Wales, into town warehouses, where they were stored until loaded aboard fast steamers bound for Confederate ports. Confederate purchasing agents and British speculators - English, Scots, Welsh and Irish - rented every available wharf, storehouse and warehouse, often at exorbitant rates, while Bermudians made fortunes from renting or leasing their wharves or warehouses. It turned usually sedate St. George's into an overcrowded, polluted, often lawless and dangerous town, especially with sailors looking for liquor and women. In those days, with the fastest method of transport by a slow sea crossing, the principal local British authorities, transferred from this town to Hamilton since 1815 and with only a small British Army garrison in the town, only 18 miles away by road but three or more hours away in fact, were unable as well as probably unwilling to act to stamp out the US Civil War-induced trade and profiteering emanating from this town. 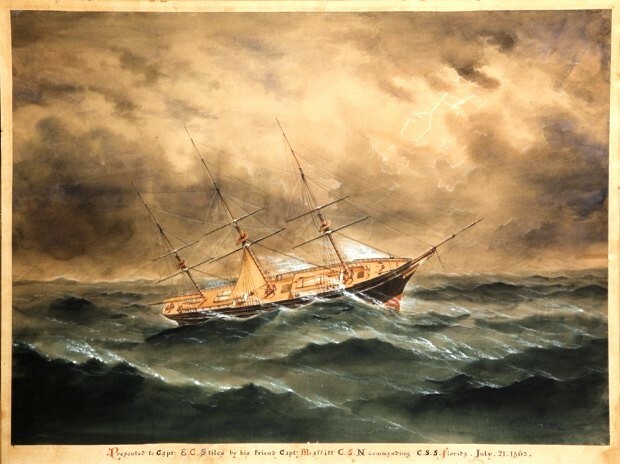 In October 1864, Bat, length 230', beam 26', draft 7'6", speed 16 knots, her sisters Owl, Stag, and Deer were side-wheelers with long, low, molded steel hulls, schooner-rigged fore and aft, with two funnels. They had twin, 180-nominal hp., vertical, double-oscillating, Watt engines and capacity for 800 to 850 bales of cotton, plus enough anthracite to return from Nassau, Havana or Bermuda. Bat reached Halifax on her maiden voyage and ran down to the Cape Fear River, attempting entrance the night of October 8 1864 with a cargo of shoe machinery and 200 tons of coal; she was turned back by blockaders. On October 10, Captain A. Hora, a blockade runner, tried again and was hit by USS Montgomery. The 30-pounder amputated the leg of seaman Match Madick, an Austrian, who had been captain of the forecastle in the Alabama during her battle with USS Kearsarge. Captain Hora surrendered and called Montgomery's surgeon but Madick died. Flamingo, length 270', beam 24', draft 7', crew 45, speed 16 knots. She suffered a serious setback in Bermuda, with with her sister, Ptarmigan, while their crews battled yellow fever. She was wrecked off Battery Rutledge on the north side of Charleston harbor. Florida. A major Confederate ship, frequent visitor to Bermuda. She caused problems galore for Union forces trying to capture her. Florida, as painted by prominent contemporary Bermuda-based artist, Edwin James. Greyhound was fast, with red streak along her light lead colored hull. Built in Liverpool in 1863 she left for the Confederacy on January 5, 1864 on her maiden voyage, and ran between there and Bermuda mostly. Commanded by Lt. George Henry Bier, CSN, on 9 May 1864 she ran out of Wilmington NC, with 820 bales of cotton, 35 tons of tobacco and 25 casks of turpentine. Captured next day by USS Connecticut, she became celebrated as the ship that carried a mysterious "Mrs. Lewis", soon recognized as "the famous rebel lady, Miss Belle Boyd.” The prize master, Acting Ensign Samuel Harding, Jr., USN, who took Greyhound to Boston was persuaded by his charming prisoner to let Captain Bier escape from Boston to Canada; for this Harding was dismissed from the US Navy in disgrace, so married Belle Boyd in England. Lynx was a long, very fast Clyde-built (in Scotland) paddle-steamer with two stacks and two masts, all painted white. She met her end bound for Bermuda, running out of Wilmington NC, under Captain Reid, with 600 bales of cotton, passengers and special cargo, including $50,000 in gold. She was hit eight times, six below the waterline, by the 100-pounder and 30-pounder rifles of much slower USS Howquah, assisted by Niphon and Governor Buckingham. Sinking, with one of her wheels damaged, Lynx was beached about six miles below Fort Fisher. The Confederates all escaped, along with the gold, although Federal sharpshooters got near enough to wound one crew member. The ship's remains were set afire. Owl, length 230', beam 26', draft 7'6", speed 14-16 knots. She was at Bermuda with cotton. Captain John N. Maffitt, once the Florida captain, collected the latter's survivors in Bermuda. (She was a Confederate cruiser sunk by the Union Navy). Robert E. Lee, length 283', beam 20', draft 10', speed 13.5 knots. 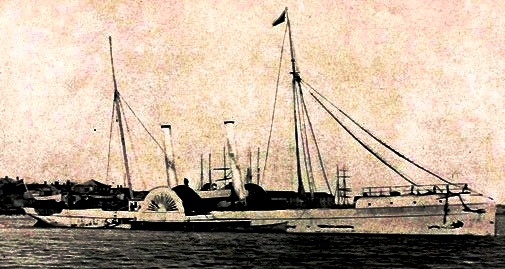 A schooner-rigged, iron-hulled, oscillating-engined paddle-steamer with two stacks originally the Giraffe, built on the Clyde during the autumn of 1862 as a fast Glasgow-Belfast packet. Alexander Collie & Co., Manchester, acquired her for their blockade-running fleet but were persuaded by renowned blockade-runner Lt. John Wilkinson, CSN, to sell her to the Navy Department. Her first voyage, for the Confederate Navy, was into Old Inlet, Wilmington NC, in January 1863 with valuable munitions and 26 Scot lithographers, eagerly awaited by the Government bureau of engraving and printing. She established a legendary reputation by outracing the blockader USS Iroquois. Lt. Richard H. Gayle, CSN, assumed command in May, relieving Lt. John Wilkinson. Robert E. Lee's luck ran out on November 9, 1863, after 21 voyages in 10 months carrying out over 7,000 bales of cotton, returning with munitions invaluable to the Confederacy. She left Bermuda five hours after her consort, Cornubia, only to be run down a few hours later by the USS James Adger. Stag. Length 230', beam 26', draft 7'6", speed 16 knots. She was a fast, modern, steel paddle-steamer built for the Confederate Navy at Liverpool as Jones, Quiggin & Co.'s Hull No. 169 in 1864 to the order of Cdr. James D. Bulloch, CSN. She sailed from Liverpool on her maiden voyage in August, getting away from Nassau about 1 September. For the rest of the year, she was busily running out of Charleston and Wilmington to Nassau or Bermuda. She fell into Union hands when she attempted to run into Wilmington in January 1865; Fort Fisher having just fallen, she was trapped by the Union Navy along with the Charlotte. In January 1865, when Wilmington, North Carolina was captured by Union forces, the fleet of blockade runners based in Nassau and St. George's, Bermuda, vanished - and so did the prosperity that the US Civil War had brought Bermuda by being so hugely on the side of the Confederates. At this museum, see the story of Bermuda and the American Civil War and a video with great images of the forces which shaped Bermuda, titled Bermuda: Center of the Atlantic. A steeply inclined street at the western end of Water Street. It has been re-surfaced with brick paving. Former overhead wires have been relocated underground. The street takes its name from blacksmith Samuel Adams who opened his Old Town shop in the 1700s while his brother built the Armoury building at the end of the street. The Rev. Richard Tucker acquired the blacksmith's shop in 1852 but it is not known when the shop stopped operating. Behind King's Square. The house that stands today is a circa 1700 mansion, one of the earliest in the area, once near a bridge across a creek from the sea to a marsh. The original building which the present house replaced was a timber-frame house erected by planter and shoemaker Roger Bailey, whose father arrived in Bermuda before 1623. The present house was once the home of Governor Benjamin Bennett in the early 18th century and later the American-born Revolutionary War Loyalist and privateer Hon. Bridger Goodrich and his wife Elizabeth. He purchased Bridge House for US$1,000 cash and prizes he amassed from capture by his Bermuda-built privateering vessels and their commanders of a large number of American ships during the Revolutionary War, after his American home and lands were confiscated by their local authorities. His ships blockaded Chesapeake Bay, much to the consternation of Thomas Jefferson and others. Goodrich was appointed to the local Legislature, hence his Honorable title. There's an ornate Memorial to him in nearby St. Peter's Church. His exploits are written about in full in the 2012 book "The Prince of Privateers. Bridger Goodrich and his Family in America, Bermuda and Britain 1775-1825" by Nick Hartley. Later, the house ownership passed from Bridger Goodrich to Edward Goodrich. The house today, after many subsequent owners and most recently the Bermuda National Trust (BNT), the present owner, has the Bridge House Apartment, an office and artist's studio. Both the main house and rented apartment received sensitive but significant BNT upgrades in 2013-2014. Keith Forbes graphic. 2 King Street, GE 05, telephone 297-1532, fax 297-0062. Near the State House, this venerable building had a 1996 $175,000 restoration project spearheaded by the Bermuda National Trust and supported by the St. George's area Chamber of Commerce and several commercial organizations. The Corporation of St. George's - the municipal agency that runs the town - has offices here. The Town and Parish are served by the following routes, some for a much longer length of time daily than others. See the schedule available free from the bus terminal in Hamilton and note its times on Monday to Friday, Saturday, and Sunday & Holiday, as well as where the routes go and do not go. # 6 route (St. George's to St. David's). Water Street. Not a casino as we know it today but a historic building owned and operated by the Bermuda National Trust and open to the public. There are a number, representing different faiths, including the Catholic Church of Stella Maris built in 1947. See Bermuda's Cruise Ship Season. 2017. January 30. Construction work on upgrades to the St George’s Harbour shoreline has got under way in preparation for the return of regular cruise calls to the town this summer. The redevelopment project will include a major facelift of Hunter’s Wharf to accommodate the two new Norwegian Cruise Lines ferries that will bring visitors to the East End from Dockyard as well as improvements to Penno’s Wharf. Mayor Quinell Francis told The Royal Gazette that crews had made good progress and that work was anticipated to be completed by the end of March in time for the first cruise arrival on April 6. “Crisson Construction started work on January 16 and so far it is going well,” Ms Francis said. “The work on Hunter’s Wharf is to restore the sea wall that was destroyed by Hurricane Fabian. This wharf is going to be the new location for the ferries and the NCL tender.” The $2 million project will also involve extensive improvements to Penno’s Wharf, including bollard replacements, refendering and dock resurfacing. “Work on both Hunter’s Wharf and Penno’s will be completed by the end of March,” Ms Francis added. “The project has been funded thanks to a $1.4 million grant from the Government, while the Corporation is putting forward the rest of the budget. While work is ongoing we would remind people that they cannot park in this area. If you are visiting the restaurants and shops in the west of the town, you should park in Tiger Bay, while if you are in the east of the town you should park in King’s Square of Market Wharf.” Twelve extra cruise ships are to call on St George’s each year from 2017 to 2022 as part of a deal between the Government and Norwegian Cruise Lines. The agreement also includes bringing two catamaran ferries to the island for the run from Dockyard to the East End, along with a yearly investment of $150,000 by NCL to sponsor tourism enhancement in co-operation with the Bermuda Tourism Authority. 2016. November 1. A small team from the Bermuda Tourism Authority hit the cobblestone streets of St George’s on Monday to get the word out about the increase in visitors expected in the old town next year. Cruise calls dedicated to the East End are expected to go from four in 2016 to 15 in 2017. “We want to make sure everyone is ready to seize this opportunity,” said Chief Product and Experiences Development Officer Pat Phillip-Fairn, who led the team in St George’s. “There is palpable optimism in St George’s now. This is a slice of the island’s tourism success carved out specifically for them. Stakeholders in the East End can decide how best to take advantage of these calls for their business.” The BTA provided St George’s stakeholders with the scheduled cruise calls for their area and “encouraged them to arrange staffing levels and opening hours that put them in the best possible position for success”. Marine and Ports is expected to make the full 2017 Cruise Ship schedule available on its website this week. The expectation for 2017 is 15 cruise calls for St George’s and 24 for Hamilton. Large cruise ships cannot enter the town. They must anchor and take passengers ashore by tender. Smaller cruise ships - up to 700 feet in length - can dock in town (a) when wind conditions are favorable and (b) they can access Town Cut, in one of two places, Ordnance Island - no longer an island, once a British Army military depot and wharf, then a US anti-submarine base during World War 2 - or Penno's Wharf. When wind conditions are not favorable for cruise ships to enter Town Cut to get to St. George's, they are diverted to elsewhere in Bermuda. Both are within easy walking distance of attractions for all who are not severely disabled in a wheelchair or needing a stick or crutches. There is no elevator service for the disabled from the ships to the docks. Ordnance Island, town centre. Photo right: by this author Keith A. Forbes. Open to the public daily. A replica of the ship that in 1610 saved the starving colonialists in Jamestown, Virginia. It was rescued thanks to concerned citizens in St. George's, after very nearly being demolished. Over the past few years, the wooden vessel had fallen into a state of disrepair with rotted planks, structural damage from the elements and a missing mast that was destroyed during Hurricane Fabian in 2003. With demolition on the horizon, the Corporation of St. George's and the St. George's Foundation appealed to the public for financial support. The improvements include an educational exhibit to visually depict the ship's history and voyage from Bermuda to Virginia in 1610. 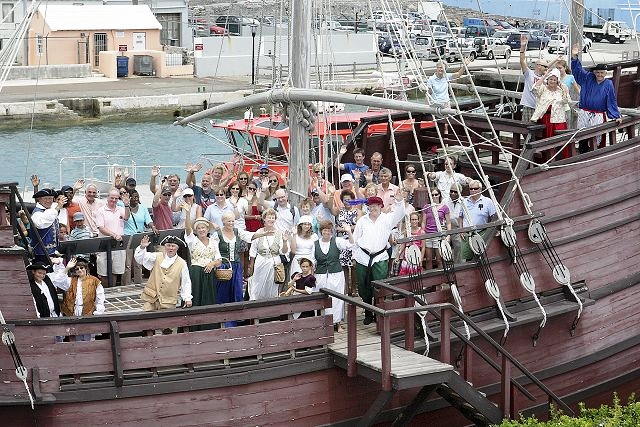 The replica, originally built in 1967 by the Junior Service League of Bermuda, was privately owned since 1995, most recently by Nick Duffy who donated the vessel to the St. George's Foundation. The restoration, which began in September 2008 and was completed in February 2009, was undertaken by Michael Hooper, a resident of St. George's. Improvements included replacing any missing or rotten planks, fortifying the existing masts, building and erecting the missing mizzenmast, replacing the rigging, installing floodlights to illuminate it at night and ensuring the ship is waterproof so that the exhibit equipment will not be damaged. Future visitors can expect to see a circular tour of the ship with facts about its history on the walls in words. The renovations were completed in time to participate in Bermuda's 2009 400th anniversary celebrations and take a leading role in educating children about Bermuda's history. Persons setting foot upon the restored Deliverance will be able to imagine life aboard it as it travelled to Virginia. One of the many striking exhibits is the one-of-a-kind talking figure that leads visitors on an audio-visual tour of Bermuda's history. As visitors enter the ship they are greeted by a figure, a sort of robot, of William Strachey, a 1609 passenger on the original Deliverance, whose writings announced the passengers were saved, not lost, and whose words were likely borrowed by Shakespeare when he wrote The Tempest as the true tale of what devised. The replica pays homage to the vessel that sailed from Bermuda to Virginia in 1610 and was credited for saving the struggling colony's starving British inhabitants from their demise. The original Deliverance, which was not saved, was built in 1609 to 1610 by Admiral Sir George Somers and Governor Elect Sir Thomas Gates. The ship allowed them to continue their 1610 journey to Jamestown, Virginia, after 42 weeks in Bermuda. She was constructed at Buildings Bay from spars and timber salvaged from the Sea Venture - and native Bermuda cedar. 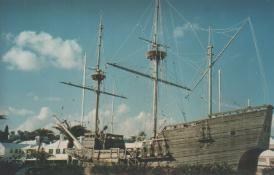 She was the larger of the two Bermuda built vessels and had about 80 of the 142 castaways. When the colonists arrived in Jamestown ten days later, they had enough food to buy some time for the Colony of Virginia, then with only about 60 souls remaining from the first two expeditions and those who had come ashore in 1609 as survivors of the seven other ships of the Third Relief Supply fleet also commanded by the Admiral. Disabled parking around the town generally is poor. Unlike in the USA, United Kingdom and North America where certain properties regardless of age or historic registration open to the public must be accessible to the unaccompanied handicapped or disabled, this is not yet a requirement in Bermuda. There is no legal requirement to have any property comply with Americans with Disabilities Act (ADA) standards. On that part of Ordnance Island that was once the separate Ducking Stool Island, this was used for public civil punishment in the 17th and 18th centuries. Troublesome people were immersed into the harbor waters. It cooled them off and terrified them out of their anti-social behavior. Visitors on a Wednesday at noon and at certain other times will see a modern day local lady volunteer for "witch for a day" duties, getting herself ducked according to ancient custom. 36 Wellington Street. Historically important, built in 1795 by then-St. George's Mayor Andrew Durnford, once of the British Army based in Bermuda, as his residence. Durnford was assigned to Bermuda from the UK with one of his specific assignments to oversee, maintain and improve as needed or ordered the construction work of the British Army's forts in St. George's, including Fort Cunningham on Paget Island. It has since been claimed, but never proved, by some of his fellow officers, that part of the funds allocated for forts were diverted to build this house. His enemies referred to this house as the Fifth Fort. Some of his enemies called this house 'The Fifth Fort'. It is an attractive pink colored large traditional house with white slanted roof in a lush garden setting. A stairway with two support walls (welcoming arms) leads up to upper level. Durnford was not able to live there for long, he died on He died on September 11, 1798 and was buried in the grounds. His memorial is still there. 10 Governor's Alley. Historically important small residential cottage, built around 1707, much extended in the late 1700s but with original architecture. In the 1800s it was bought by Miss Fanny Zuill, who was very briefly married a Mr Fox. She spent the rest of her life here. 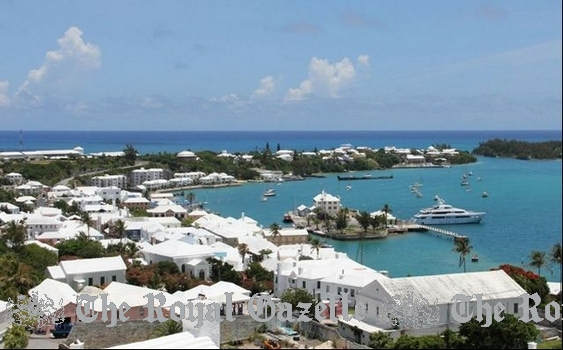 It is now owned by the Bermuda National Trust and leased. One of the historic and quaint streets of the town, known chiefly for its (a) Featherbed Alley Print shop museum and (b) St. George's Historical Society Museum. The print shop museum was located in the lower level (once the servant's quarters) of Mitchell House at 3 Featherbed Alley. The house is named for its architect, Walter Mitchell, who had it built in the 1720s. The museum featured a replica Gutenberg press. The museum was an 18th Century print shop, though its location was never formerly the site of such a business (see below). The Featherbed Alley Printshop concept was created by the Department of Tourism (DOT) of the Bermuda Government. 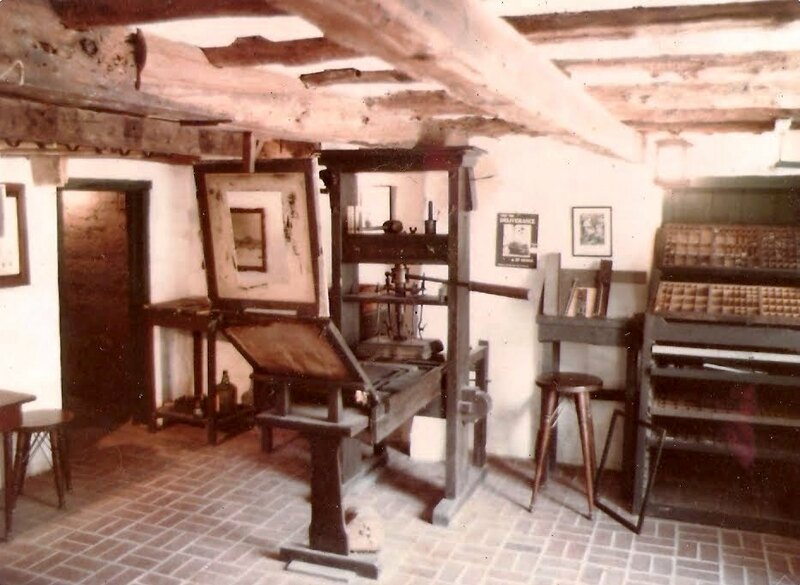 The Gutenberg press was obtained from a local printing business which had imported it some years earlier.There is also a working replica of a Gutenburg printing press (brought to Bermuda in 1784 to print the colony's first newspaper). It was first invented in Germany in the late 1400's and refined slightly in the 1500's. 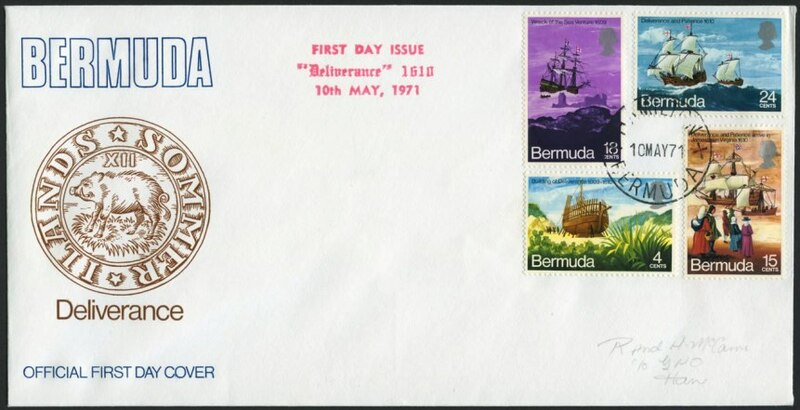 It remained popular in Bermuda and elsewhere for printing of broadsheets for well over 300 years. The museum is largely dedicated to the history of Bermuda's first newspaper and printing business, that of Joseph Stockdale, who published the Bermuda Gazette. Stockdale originally operated his business from the cellar of his own house, Stockdale House, on Printer's Alley nearby (currently a private home, belonging to former news editor Bermudian Lt. Col. Gavin Shorto). Following his death, Stockdale's heirs continued to run operate the business from Stockdale House until they relocated to Hamilton, Bermuda, following discontinuation of St. George's as Bermuda's capital's in 1815 in favor of the much more centrally located and then new City of Hamilton. It is said that St. George's folk objected so much to the relocation and the business reasons for it that they petitioned against the Bermuda Gazette, and the cancellation of subscriptions by many in St. George's, resulting in the closure of the newspaper. However, it was later reconstituted as the Royal Gazette, today Bermuda's only daily (Monday to Saturday) newspaper which has never been printed or published here, instead in Hamilton. Throughout the 1980s the Curator of the museum was the late Major Donald Henry 'Bob' Burns, MC, famous also as the town crier of St. George's, and holder of the Guinness Book of World Records record for the loudest human speaking voice. The upper level of the house holds the St. George's Historical Society Museum (see separate entry). East of Town Hall at dock. See under "Ferries" in Bermuda Transportation for Visitors. Off Bridge Street, to accommodate dinghies from visiting yachts. The raft is situated in Market Wharf, near the toilet block off King's Square, a listed building. The block dates back to the early nineteenth century and features a non-lapped stone roof and unusual small false chimneys. In the 1870s it housed the McCallan's grocery store and bake house, and in the 20th century it was in turn Annie Beach's restaurant, a tavern, Ernest Smith's tailor shop, plus a jewellery business of George Rankin Sr.